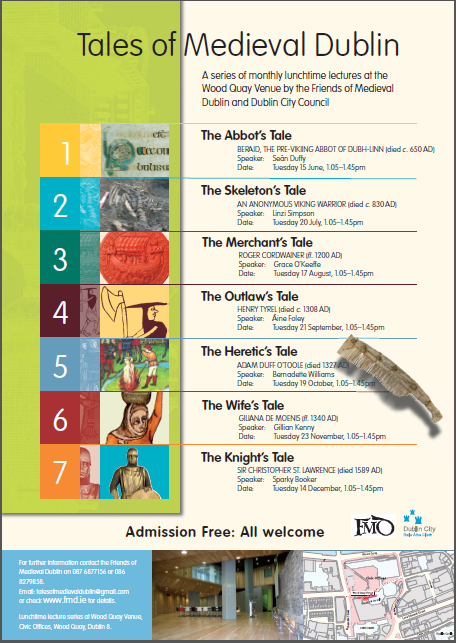 During Heritage Week 2009 the Friends of Medieval Dublin conducted a series of guided walking tours around Dublin’s medieval core. Each of these walks was oversubscribed and the passion for the city’s history was palpable. Some of the people on these walks were tourists and neophytes to medieval history, but many of them were also regular attendees at the annual Medieval Dublin symposium. Everyone seemed to be very interested in being given more opportunities to engage with Dublin’s past. 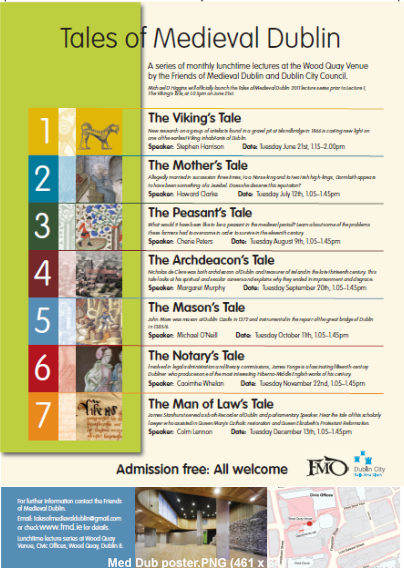 As a result the Friends of Medieval Dublin resolved to meet this need and so created a free monthly lecture series which we added to our annual calendar of events. 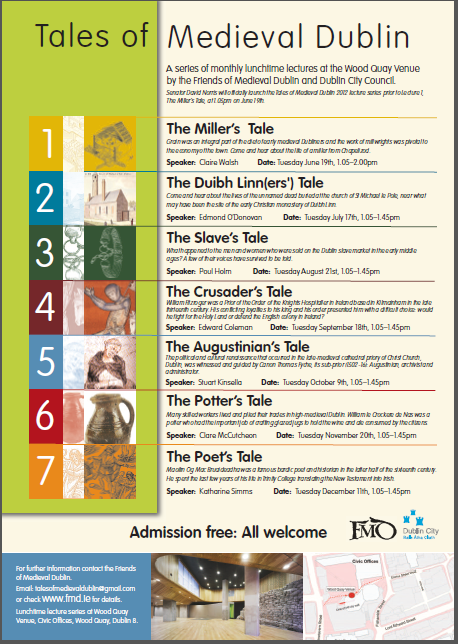 The Tales of Medieval Dublin series was introduced in 2010 and ran from June to December. Each ‘Tale’ focused on a different, fascinating inhabitant of the medieval city allowing modern audiences a chance to ‘meet’ their predecessors. These brief biographical sketches provide a unique way of viewing the exciting episodes and developments in Dublin’s history. Spanning Dublin’s pre-Viking roots all the way up to the early seventeenth century, people from all walks of life are discussed, though there was a particular emphasis on the everyday men and women who were the backbone of the community. The series ran successfully for three years and completed with a volume of essays, a collection of Tales about ordinary inhabitants from an extraordinary medieval city.